NOTE: All measurements are in millimetres (mm). CF is an abbreviation of conventional flue. Please ensure to have a survey carried out by a Gas Safe Register registered gas installer to check and certify the compatibility of your room and intended location with this fire before making any purchase to avoid disappointment. The touchlight top control option will only operate after manually lighting the permanent pilot, the fire is then controlled from two high level switches - On/Off and High/ Low. Mains electricity may be required. Also be aware that due to the fire producing heat the interior of the fire may become marked over time through general wear and tear which is quite normal and to be expected. The inside of the glass may also require cleaning from time to time due to condensation that may form on the inside of the glass. 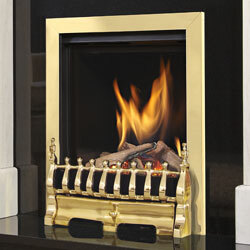 As with all balanced flue gas fires and glass fronted fires generally, the glass may have condensation marks appear on the inside of the glass from time to time which is quite normal and to be expected. Simply remove the glass periodically and clean the glass with a suitable glass cleaner, allow to dry thoroughly and replace accordingly. The 15 year Guarantee/Warranty offered by BFM Europe Limited on Kinder gas fires covers manufacturing and material defects, including parts and labour (but excludes consumables), providing and subject to an annual service and annual replacement of the oxy-pilot assembly being performed each and every year during the 15 year period, from the date of purchase. Failure to carry out a service annually and or replacement of the oxy-pilot would render the 15 year Guarantee/Warranty null & void and you would only be entitled to a statutory 1 year manufacturers Guarantee/Warranty. NOTE Combustible material should be at kept away from this appliance at all times.